Set in the near future, Frank, a retired cat burglar, has two grown kids who are concerned he can no longer live alone. They are tempted to place him in a nursing home until Frank's son chooses a different option: against the old man's wishes, he buys Frank a walking, talking humanoid robot programmed to improve his physical and mental health. What follows is an often hilarious and heartwarming story about finding friends and family in the most unexpected places. Starring an ensemble cast led by Academy Award nominee Frank Lengella (2008, Best Actor, Frost/Nixon), Academy Award Winner Susan Sarandon (1995, Best Actress, Dead Man Walking), Liv Tyler and James Marsden. $35.539 thousand on 2 screens. Though saddled with a dopey title, Robot & Frank gives us an intriguing story. Set in an unspecified but not-too-distant future, we meet Frank Weld (Frank Langella), an elderly former cat burglar. As Frank gets older and his cognitive skills decline, his grown son Hunter (James Marsden) considers placing him in a nursing home but eventually chooses a different option. Instead of assisted living, Frank gets a robot. The VGC-60L (voiced by Peter Sarsgaard) offers a companion who can take care of Frank and keep him on target through his memory episodes and other issues. At first, Frank resists this mechanical nanny, but he eventually embraces his android pal – and uses him as an aide to resume his chosen field. We follow their criminal endeavors as well as Frank’s gradual path into greater dementia. When I commented that Robot delivers an interesting narrative, the truth is that it’s more of a concept than a real story. It emphasizes character above all else, so while Frank’s re-entry into the world of crime becomes an element, it borders on MacGuffin territory; we follow Frank’s escapades solely as an excuse to watch his personality boost and his relationship with the VGC-60L. In that regard, it works well. Robot turns into a warped “buddy flick” that shouldn’t succeed but does. Really, on paper, the notion of a senile old man paired with an automaton sounds like so much bad comedy fodder, but it proves to be surprisingly winning. Frank and the VGC-60L offer an endearing pair who interact in a likable manner; we buy their growing friendship, even with the limitations that come with the non-sentient nature of Robot. Langella does a lot of the heavy lifting and almost single-handedly grounds the movie. A character like Frank could easily turn into a hammy mess, but Langella never lowers himself to that level. We don’t get some addle-brained oldster who shows over the top emotions; Langella keeps a pretty tight lid on the character that allows us glimpses of Frank’s issues without overt theatrics. I can’t overstate how important this becomes. Like I mentioned, Robot could – and probably should – have been little more than a sappy piece of fluff, but with Langella in the lead, it becomes natural and surprisingly believable. None of the other characters exist as much more than plot devices, and the notion of Frank’s rebirth when he and Robot turn to crime remains thin, but damn if it doesn’t work. It helps that the movie avoids the TV drama pathos that would often mar an effort like this. While the flick delivers some emotional impact, it remains low-key and doesn’t actively pull at our heartstrings. This allows the sentiment to work better; we don’t feel as manipulated, so we buy into the situations and characters much more. At no point does Robot & Frank threaten to turn into anything more than a minor pleasure, but it’s a pleasure nonetheless. With excellent acting and a good balance of drama and comedy, it winds up as a likable, engaging little film. Robot & Frank appears in an aspect ratio of approximately 2.40:1; the image has been enhanced for 16X9 televisions. The picture never excelled, but it was satisfactory for SD-DVD. Sharpness was usually fine. Wider shots tended to be a bit soft, but those instances weren’t extreme, and much of the flick offered decent to good clarity. Shimmering and jaggies were minor, but I noticed some mild edge haloes through the film. Source flaws were non-existent, as I detected no specks, marks or other blemishes. The film’s palette usually opted for a chilly blue orientation or a mild amber path. Within that design range, the colors seemed fine; they weren’t especially strong, but they seemed acceptable. Blacks tended to be somewhat inky, while shadows showed reasonable smoothness; a few overly dark scenes emerged, though. Nothing here did much to impress, but this was an acceptable presentation. Don’t expect fireworks from the film’s Dolby Digital 5.1 soundtrack, as we got a mix heavy on music and general environmental material. When the track used the side or rear speakers, it was usually for score or material like nature or street sounds. Some localized dialogue also appeared. Nothing memorable fleshed out the track; it fit the movie reasonably well but didn’t add much. Audio quality was usually fine. Speech was the weakest link; while most of the lines seemed natural enough, some exceptions occurred and could give the dialogue a compressed, shrill sound. Effects did little to tax my system but they were clear and accurate enough. Overall, this ended up as a decent but unspectacular track. A few extras fill out the disc. We find an audio commentary from director Jake Schreier and screenwriter Christopher Ford, both of whom sit together for this running, screen-specific look at the film’s roots and development, story/character/script areas, cast and performances, sets and locations, various effects, editing, music and cinematography, and some other areas. Schreier and Ford combine to make this a brisk and bubbly commentary. Their friendship comes through to add spark to their chat, and they make sure they cover all the appropriate topics along the way. We learn a lot about the movie and have a fun time as well. A Robot Poster Campaign Gallery also appears. It features 24 stills that all display “VGC-60L: The Future Is Now” with a mix of photo images. This offers mild fun but not much of interest. The disc opens with ads for The Intouchables, Seven Psychopaths, Looper, Company of Heroes and The Words. These also pop up under Previews but we don’t find the trailer for Robot itself. 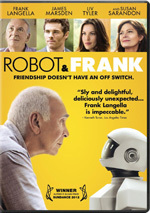 When I went into Robot & Frank, I feared that it’d degenerate into a maudlin vision of elderly dementia. Happily, it avoids those trappings to deliver a warm, gently amusing character piece. The DVD comes with acceptable picture and audio as well as an enjoyable commentary. Plop this one in the “recommended” file.